Hello Friends, One of my good blogging/ stamping friends Donna is hosting a challenge over at Stamp TV and I wanted to make sure I joined her, so over the past two days when I had the chance, I went into my studio to attempt to create something for her ” Beach Worthy” challenge. 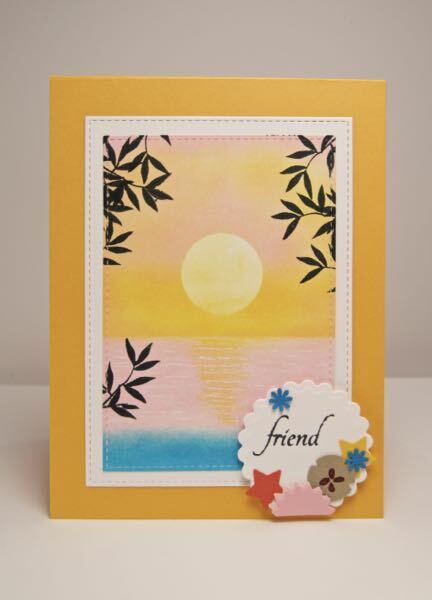 I also have been wanting to try my hand again at making a sunset card with the success of the UBER talented Theresa Momber and here are the two links that inspired me. Here and Here. 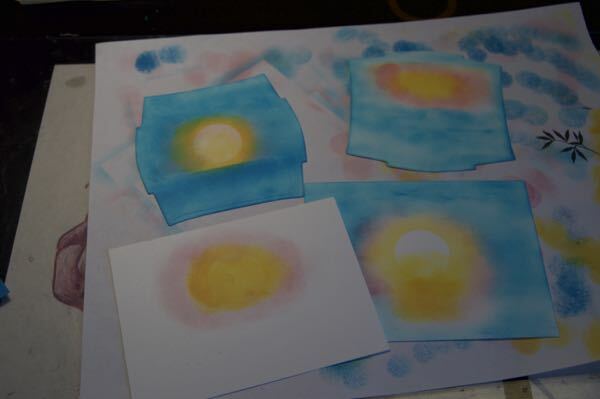 I will also share with you a photo of my 4 reject attempts….LOL. I refused to throw in the towel!! I am so glad I didn’t! I didn’t have any shell stamps so I made my own with paper. I hope that you knew those were sea creatures before I mentioned it. If you didn’t please…lie and say you did. LOL The sentiment and leaves are from two different Gina K. stamp sets, the Flowers Bloom and the Fleur Di Lis. I took a prisma colored pencil to do the reflection in the water and took my white gel pen to make some subtle white caps. I am absolutely in love with my new rectangle stitched dies from MFT and I am just going to apologize right now, because they are going to continue to be very prevalent in my cards, that is…. till I get a different set of stitched dies. LOL I hope you know how much I enjoy your comments when you stop by, I really really do! Here are my early stage rejects! Categories: Cards | Tags: Card making, Cards, friendship, rubber stamps, Stamp TV, stamping, Thinking of you | Permalink. Whoa, Nancy, that looks amazing. I love the sun rippling in the water like that. Gorgeous! Oh my! Girl you have aced this scene beautifully. I just love the sun on the water. They say practice makes perfect and perseverance – well you did that and beautifully. Lovely calming scene you created Nancy. Just enough ripples in the sea to finish off your gorgeous card. You are so kind Ina!! ps Thanks for the sympathy card – I really appreciated it! Thanks you are so welcome!! Must be 5 time’s the charm for you, Nancy, because this one looks fantastic. I love the reflection in the water and I recognized the sand dollar right away. This is beautiful, you did a great job creating your sunset. I love the stitched rectangles also. LOVE your beachy sunset! Looks so real, Nancy!